European Light Expression Network (ENLIGHT) was a European Network connecting Cultural Organisations in the UK, Norway and Italy that enabled artists to develop new skills working with technicians and scientists to create a series of accessible, large-scale public realm works realised through international collaborations for international audiences. Running for 30 months the project delivered 2 international lab events, 6 international collaborative residencies, commission 6 major artworks and produced 2 light festivals. You can read more about the festivals we delivered on the SPECTRA pages and the ENLIGHTEN festival page. MIRIAD (Manchester) will be the project managers across logistics and strategic project promotion. They will act as the central point of contact for all other partners, participating artists and technicians and be responsible for project visibility across the EU and internationally. They will ensure that the project features in strategic regional, continental and trans-national platforms across public facing events, academic research and international policy forums - taking the creative outputs from each partner to new audiences within the geographical area of the project through festival networks, venues and promoters as well as through contacts beyond in Southern Europe, the Middle East and Asia. All partners will benefit from their standing as a leading international education provider and be able to draw on the expertise in MIRIAD that focuses on a view of society in which the arts and wellbeing are interlinked and are vital to maintaining a vibrant and sustainable economy. i/o/lab (Stavanger) will coordinate and produce the residency in Norway taking place in 2017. During the residency they will help facilitate the artists to develop one or two major new public realm works. The artwork produced will be developed as a site specific work for Stavanger city to be displayed in collaboration with the Article Biennial October 2018. i/o/lab will incorporate the main theme of ENLIGHTEN into the Article Biennial and thereby also provide a Nordic showcase and a final promotion of the project. i/o/lab will work to promote the project internationally utilizing their efficient networks to develop the profile and exhibition opportunities for artists, technicians, partner organisations and the works themselves. The Fondazione Mondo Digitale (Rome) will coordinate the artists’ residence in Italy and will organize the exhibition of the artists’ work at its own Rome Media Art Festival 2017. The FMD has developed a rich environment for connecting artists to digital and electronic expertise. This environment is the Phyrtual InnovationGym, where artists find support to develop their projects and are able to connect their production with education working in teams with students. The artist residence related to Project Enlighten will be part of the FMD’s Educational Program. The artist will be involved in workshops with school students and NEETS, who will participate actively in the development of the artist residency project. The artwork produced during the residency will be presented during an event at the Foundation and at the Rome Media Art Festival 2017. Stanza worked with i/o/lab in Stavanger to create his piece The Global Dérive: The sum is greater Than the Parts which was shown at Spectra in Aberdeen February 2017. Tobias Daemgen was born in 1980 in Braunschweig and is currently living in Wuppertal. He graduated in Communication Design from the University of Applied Sciences and in Media Arts from the Academy of Media Arts Cologne. Since the formation of the artists collective RaumZeitPiraten in 2007 he travels internationally with exhibitions, performances, workshops and lectures. A focal point of his works is the creation of multimedia environments and performing with individualised optoacoustic instruments, experimenting with the poetic potential of science. Among others he has received scholarships from the Kölnische Kunstverein Cologne, Kunststiftung NRW Düsseldorf and the Stiftung Kunstfonds Bonn. 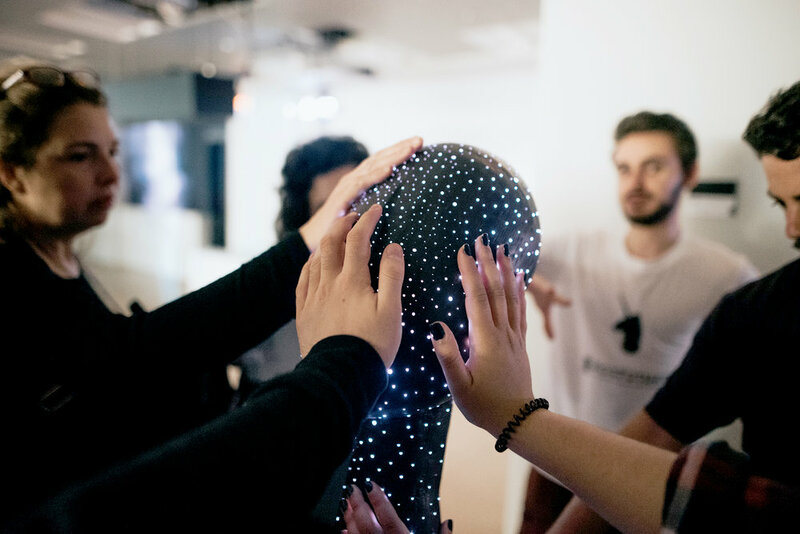 Tobias spent time with Fandazione Mondo Digitale in Rome to develop his work that was them showcased at Media Arts Festival and thereafter in Spectra in Aberdeen. Robert B. Lisek is an artist, mathematician and composer who focuses on systems and processes (computational, biological, social). He is involved in a number of projects focused on radical art strategies, hacktivism and tactical media. Drawing upon conceptual art, software art and meta-media, his work intentionally defies categorisation. Lisek is a pioneer of art based on Artificial Intelligence and Machine Learning. Lisek is also a composer of contemporary music, author of many projects and scores on the intersection of spectral, stochastic, concret music, musica futurista and noise. Lisek is a founder of Institute for Research in Science and Art, Fundamental Research Lab and ACCESS Art Symposium. Author of many exhibitions and concerts, among others: QUANTUM ENIGMA - Harvestworks Center New York and STEIM Amsterdam; TERROR ENGINES - WORM Center Rotterdam, Secure Insecurity - ISEA Istanbul; DEMONS - Venice Biennale (accompanying events); Manifesto vs. Manifesto - Ujazdowski Castel of Contemporary Art, Warsaw; NGRU - FILE, Sao Paulo; NEST - ARCO Art Fair, Madrid; Float - DMAC Harvestworks and Lower Manhattan Cultural Council, NYC; WWAI - Siggraph, Los Angeles; Falsecodes - Red Gate Gallery, Beijing; Gengine - National Gallery, Warsaw; Flextex - Byzantine Museum, Athens, FXT- ACA Media Festival, Tokyo and ISEA, Nagoya. Noise Orchestra are Manchester sound art duo David Birchall and Vicky Clarke. They use light, electronics, turntables and graphical scores to turn light, images and objects into NOISE; a process called graphical sound. Their practice operates at the intersection of art, experimental music and technology and manifests in performances, DIY instrument making, workshops and installations; all inspired by the photo-phonic principles of synthesizing sound from light. They have been artist in residence at the National Science & Media Museum, STEIM; Amsterdam, Q-02; Brussels and CTM Festival; Berlin and for the past year have been developing a series of Noise Machines modules; electronic instruments such as drones, delays and sequencers that translate light into sound, funded by Innovate UK. Chiara Passa (Rome 1973) is a visual artist based in Rome. She received an M.F.A. from the Fine Arts Academy of Rome and a Masters in new audio-visual mediums from the Faculty of Modern Literature. Her artwork explore architecture as an interface combining different media such as: Internet-art projects, animations, interactive video-installations, digital art in public space as site-specific artworks, video-mapping and video-sculptures. She also develops art-applications (AR and VR) and widgets for mobile platforms. Since1997 her artworks have been internationally exhibited from Festivals & institutions, for example: “Dimensioning" at Furtherfield gallery, (London, UK), ISEA Vancouver Art Gallery (Canada), Vortexdome (L.A.USA), Media Art Histories Conference (Riga, Latvia), Electrofringe (New Castle, Australia), FILE | Electronic Language International Festival (Sao Paulo, Brazil), MAK - Museum of contemporary art (Vienna, Austria) and CCCB – Centro de Cultura Contemporanea Barcelona (Barcelona, Spain).